Merger activity is already accelerating into the end of 2017, with CVS’ recently announced acquisition of Aetna the most recent example. If you’re a fan of the corporate mega-mergers that keep getting announced, there’s a good chance you’re going to love 2018. At least that’s the wisdom being touted by banks across Wall Street. But before we get into the mergers and acquisitions outlooks for some of the biggest firms, let’s recap what’s been a torrid second half of 2017 for large merger deals. Perhaps most notably, Broadcom is trying to buy Qualcomm for more than $US100 billion, which would be the biggest tech takeover in history. In terms of deals that have actually been agreed upon, CVS Health is buying Aetna in the largest announced M&A deal of 2017. Back in September, United Technologies agreed to fork over $US30 billion for Rockwell Collins in 2017’s second-biggest takeover. And just last week, Roark Capital, which owns Arby’s, said it would buy Buffalo Wild Wings for about $US2.9 billion. With all of that considered, it’s clear the M&A waters are churning, and the following Wall Street firms have taken notice. 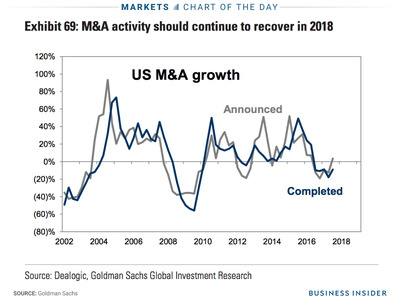 Goldman forecasts that cash M&A spending will climb by 6% to $US355 billion in 2018. 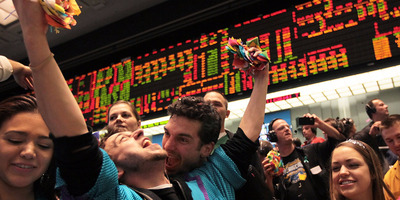 That will, in turn, boost the stock prices of companies with a high chance of being bought. 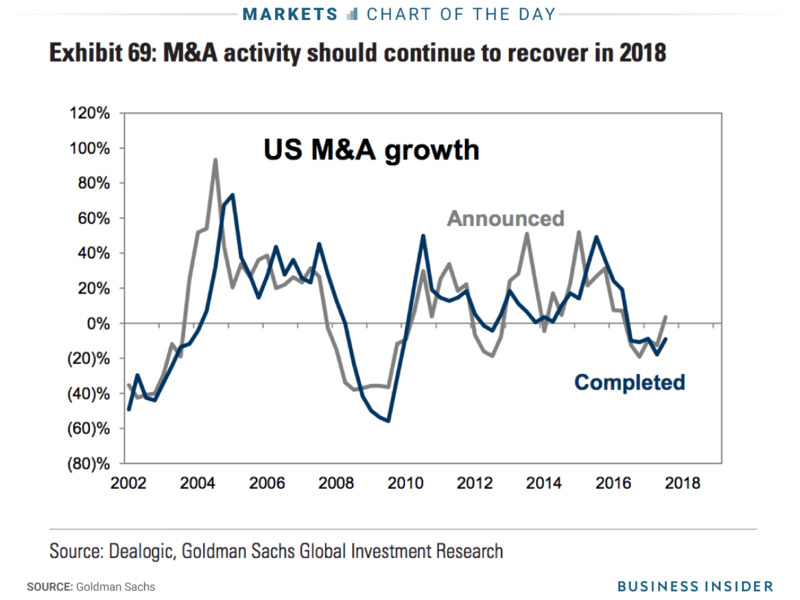 As a result, a basket of likely M&A targets is poised to outperform in 2018 after trailing the broader S&P 500 in 2017, according to Goldman. The firm is also bullish on the fact that the picture for tax reform has been clarified – a stance it shares with Wells Fargo (below). In Goldman’s mind, the M&A market was partially paralysed as companies awaited specifics. “In 2018, robust confidence and reduced policy uncertainty should increase the fundamental incentive for corporate acquisitions,” David Kostin, the head of US equity strategy, wrote in a client note. The ramping of M&A activity is a big part of Wells Fargo’s 2018 S&P 500 target of 2,784, which would mark a 5.5% increase from current levels. The firm estimates that mergers will continue in earnest during the first half of the year, driven by clarity around the GOP’s tax plan and a groundswell of pent-up demand. Wells Fargo notes that US corporations are operating with too much capacity, but argues that this uptick in M&A activity will rationalize it. The firm is also closely watching the repatriation tax holiday, which it predicts will be a huge driver of merger activity as companies forego capital spending and share buybacks in favour of M&A. Baird’s bullishness around M&A in 2018 stems largely from its outlook for private equity-backed companies. It notes that the number of such firms has surged by more than 30% from 2011 to 2017, growing each year. And Baird finds this meaningful because PE-backed companies are, by nature, more likely to be involved in M&A activity.